Write log entries by using the Cloud SDK. View and filter log entries by using the Logs Viewer. List log entries by using the Cloud SDK. List log entries by using the Logging API. You can use the Cloud Shell environment or a Compute Engine VM instance for the Cloud SDK commands in this quickstart. The Cloud SDK is pre-installed in the Cloud Shell environment. You don't need to install or configure any other software. Leave all other settings at their default values and click Create. After a moment, your VM instance is ready for your use. To connect to your VM instance shell, go to SSH > Open in browser window. After a moment, a Debian GNU/Linux shell opens in a window and displays a welcome message. gcloud logging write my-test-log "A simple entry." After the command completes, you see the message: Created log entry. When you write a log entry with structured data, you must include --payload-type=json. If you omit this field, the payload is interpreted as unstructured text. If the log my-test-log doesn't exist, then Logging creates the log when the log entry is received. 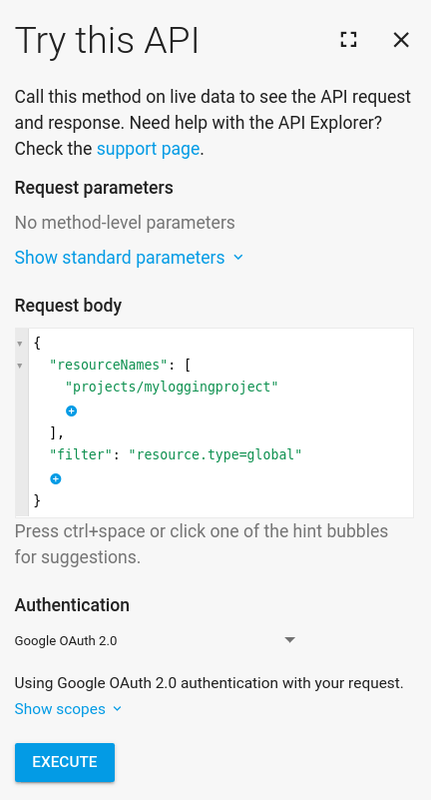 Check the Google Cloud Platform navigation bar and make sure your project is selected. Use the project drop-down list to select your project if necessary. If you don't see the Global menu option or if you don't see your log entries, wait a few minutes and refresh the page. It can take a few minutes for Logging to receive log entries. To expand a log entry, click its Disclosure button (arrow_right). The first log entry has its data stored in a textPayload. The second log entry contains structured data that is stored in a jsonPayload. The structured payload contains the keys message and weather. Note: When message is a key for a structured log entry, Logging uses it as the summary of the log entry when the entry isn't expanded. For more information on log entry data formats, see Datatypes common to all logs. In the filter box above the logs selector, enter the string simple. The logs display shows only the log entry A simple entry. After you have viewed your log, remove the filter string you added and click the Refresh button (refresh) above the logs selector. Both log entries reappear in the display. Switch to the advanced filter mode by clicking the Disclosure button (arrow_drop_down) at the far right of the filter box and then selecting Convert to advanced filter. For more information on filters, see Advanced Logs Filters. The API Explorer widget is attached to the right or bottom of the page. It has a header Try this API. Copy the following text and paste it into the Request body. Before you click Execute, replace the PROJECT_ID. ERROR: (gcloud.logging.read) INVALID_ARGUMENT: Field not found: 'resourcetype'. ERROR: (gcloud.logging.read) PERMISSION_DENIED: Request had insufficient authentication scopes. Go to the VM instance details page for your VM instance. Click Stop. This action might take a minute or two to complete. To modify the configuration, click Edit. Search for the header Cloud API access scopes, and click Details to display the settings for each API. 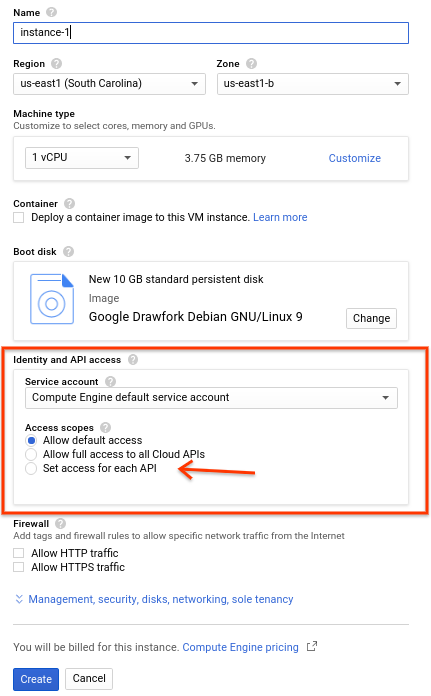 Change the entry from Stackdriver Logging API to Full. Click Save. To restart your VM instance, click Start. After a few moments, your VM is ready to use. 200 response code and no entries: If the message nextPageToken is displayed, it indicates that API Explorer didn't have time to complete the search. Add a pageToken to your request, set the value to be the same as that given with the key nextPageToken, and then retry the command. 400 response code: The filter value is invalid. For example, if you misspell global as gloobal, the message is Unsupported resource type: gloobal. 404 response code: The project ID is invalid. Check the spelling of your project identifier. You might be asked to sign into your Google account and permit API Explorer to access your account. If you don't delete your log entries, they will expire and be removed. See Quota Policy. See Logs Viewer for a more detailed discussion of the Logs Viewer. 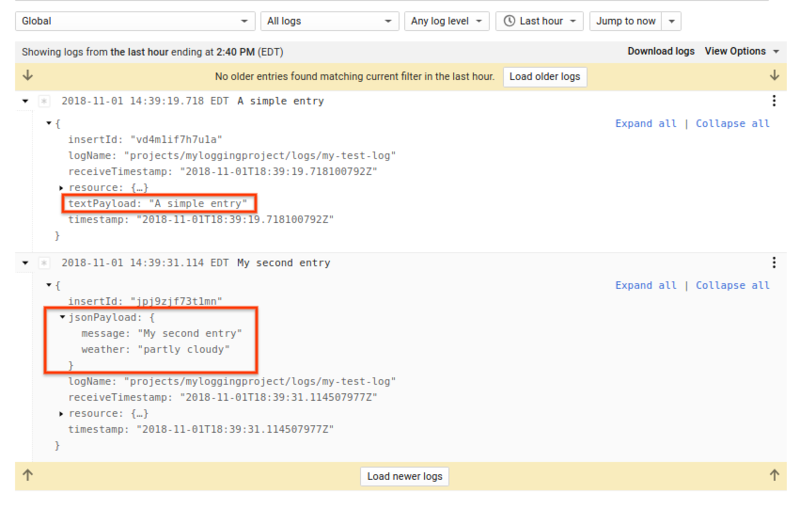 See Exporting logs to learn how to export your log entries to Cloud Storage, BigQuery, and Cloud Pub/Sub. See Logging Agent to learn how to collect log entries from your virtual machine instances in Logging. See Audit Logs for your auditing and compliance needs. See Stackdriver Logging API to learn how to read, write, and configure logs from your applications.